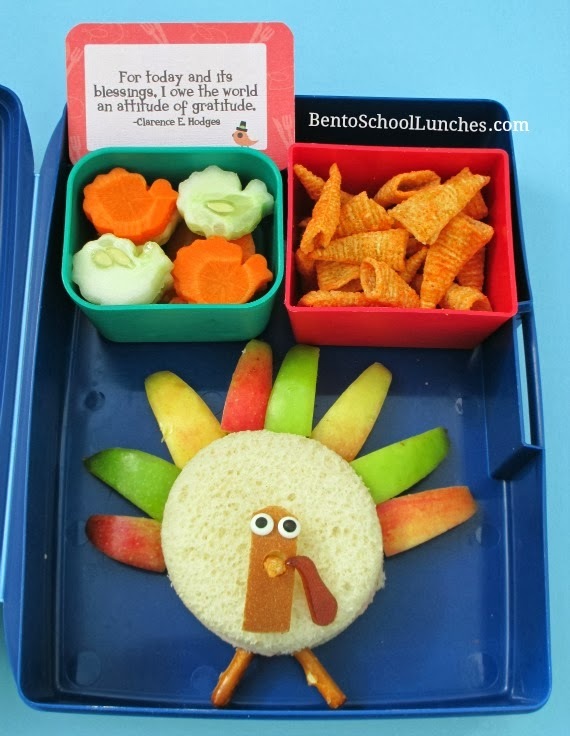 I saw this cute and fun turkey sandwich from one of my favorite and creative bloggers, Jill over at MeetTheDubiens. I loved that she used apples for the feathers and that inspired me to make a slight modified version of the turkey for Nikolai's lunch today. The turkey was made using a circle cutter for the main body, part of the bread crust for the neck and head, and slices of red, green, and yellow apples for the feathers. I used a tiny circle cutter to make a hole through which I put a part of a bugle for the beak (you can also use a straw to make the small hole). The wattle was freehand cut from fruit leather and I added parts of pretzel sticks for legs and candy eyes. Carrot and cucumber slices were cut to turkey shape with a small cutter. On the top right are some bugles. I included a Lunchbox love note from their Thanksgiving edition and packed this lunch in a Laptop Lunches. Adorable lunch! I love it all but especially your carrot and cucumber turkeys! Cute lunch and I like the note!! Thank you Kristin. :) I love the Thanksgiving edition of the notes, there are many great quotes! The turkey is so cute! Great idea!